Description Learn the fundamentals of modern web design, rather than relying on CMS programs, such as WordPress or Joomla!. You will be introduced to the essentials of good design and how to optimize for search engines. You will discover how to register a domain name and migrate a website to a remote host. Because you will have built the web pages yourself, you will know exactly how HTML and CSS work. You have will complete control over your websites and their maintenance. 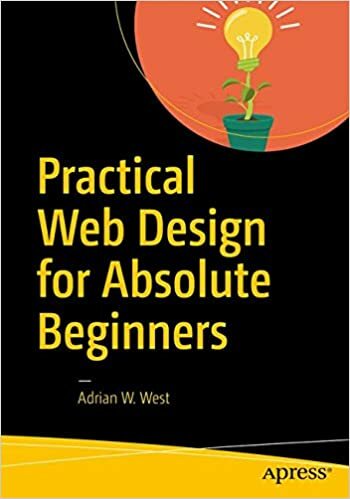 Practical Website Design for Absolute Beginners centers around introducing small amounts of new code in short practical chapters and provides many website templates that can be easily adapted for your own websites. Each chapter builds on the templates created in the previous chapter. You are provided with a practical project to complete in most chapters, and taught to produce practical web pages right from the start. In the first chapter you will install and configure a free text editor, then you will produce the structure for your first web page. You will then gradually learn to create more sophisticated and increasingly practical web pages and websites. In this book you will be encouraged by means of a series of achievable goals, and you will be rewarded by the knowledge that you are learning something valuable and really worthwhile. You will not have to plow through daunting chapters of disembodied code theory because the code is described and explained in context within each project. Because each project is fully illustrated, you will see clearly what you are expected to achieve as you create each web page. What You'll Learn Provides instructions for installing a text editor for producing HTML and CSS Shows you step-by-step how to build and test web pages and websites Teaches you how to ensure that your websites are attractive and useful Describes how to make the most effective use of color and images Teaches you the essential features of search engine optimization Shows you how to migrate your website to a remote host Who This Book Is For Practical Website Design for Absolute Beginners is for people who want to begin designing their own websites. It uses a highly motivational, easily assimilated step-by-step approach where you will start learning practical skills from the very first chapter. The book is an excellent choice for people who have computer skills but would also like to learn HTML and CSS. For readers who have little or no knowledge of HTML and CSS, the book will teach enough to complete all the projects in the book.